One idea is to remove the fire base as the kettle operates perfectly without it. Simply place the kettle on a level non-combustible surface (large flat rock / sand / gravel etc.) and slightly raise the kettle using 3-4 small flat stones to allow for air intake. The kettle should work perfectly. 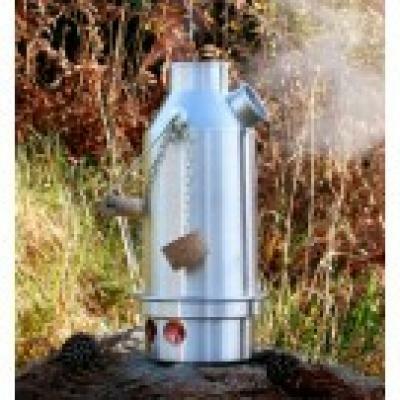 Remember that with a Kelly Kettle there is no need to carry fuel and the interior space of the kettle (the chimney) can be used to carry some of your basic survival gear items (plastic signal whistle, knives, waterproof matches etc.) once those items are sealed in a plastic bag to protect them from the thin layer of soot in the chimney. A second option for making the kettle lighter is to replace the existing handle with wire. In this case, care would need to be exercised once the kettle boils and you want to lift the kettle off the fire base. Using both hands coming in from the side, take the wire as close as possible to the connection with the kettle (without touching the kettle as it will be extremely hot) and lift the kettle straight up and away from the flames setting it down on level ground. Once the kettle is clear of the fire, the kettle can be carried normally in one hand with the wire handle directly over the chimney of the kettle. Note: Never lift your hands directly over the chimney of the kettle when the kettle is lit as it can result in a burn. Despite the size, the kettle is a better pack item.. Camping, Fun, Emergencies a Must Have! !.